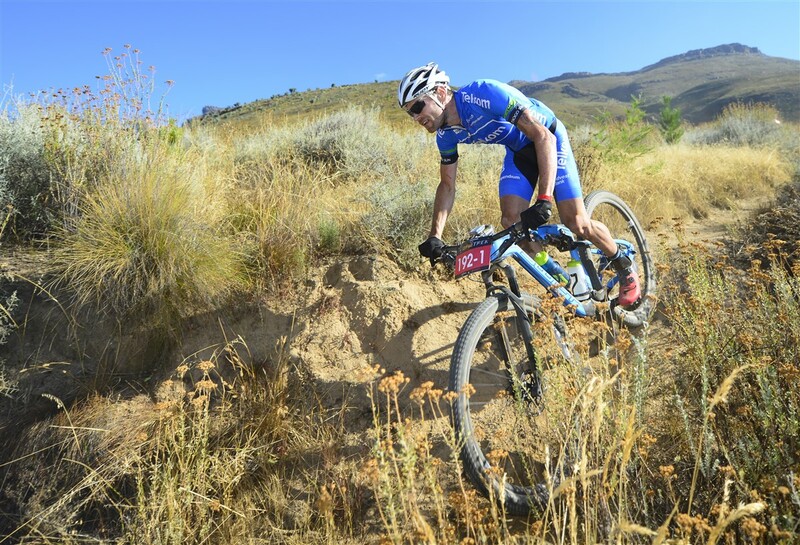 Switzerland’s Urs Huber negotiates a tricky rock section on his way to winning the final stage and the overall title with teammate, Karl Platt, at the Momemtum Health Tankwa Trek, presented by Biogen on Sunday. 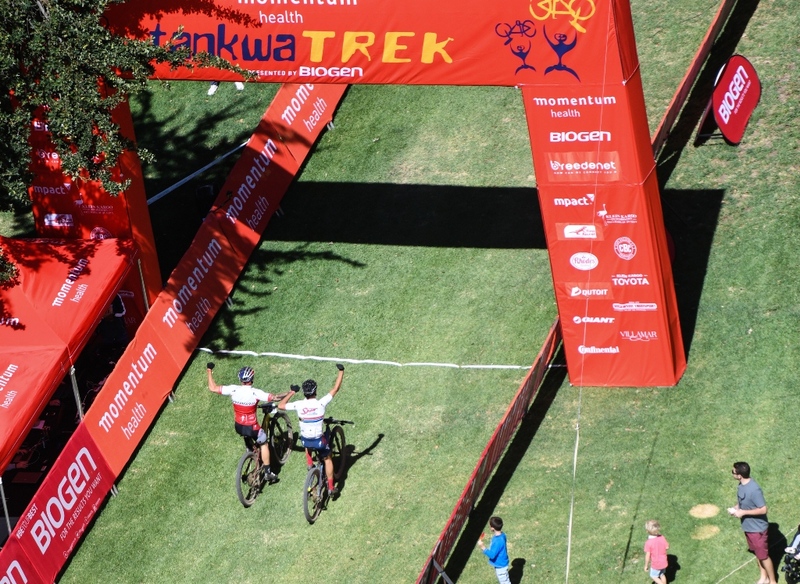 Switzerland’s Urs Huber and Germany’s Karl Platt completed a clean sweep of stage wins on Sunday to retain the Momentum Health Tankwa Trek, presented by Biogen mountain bike stage race title. 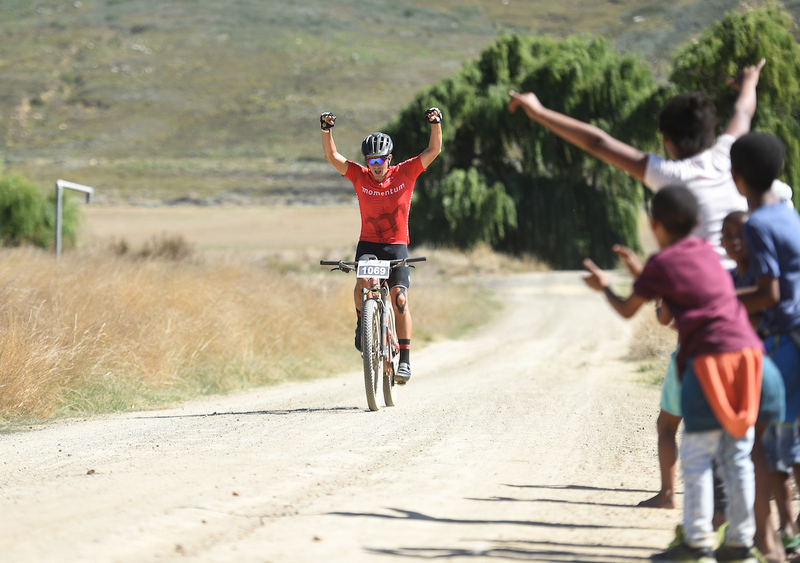 The Team Bulls duo were in control for the entire three-day event and won the final 89km stage in a time of 03 hours 05 minutes 34 seconds to confirm their impressive form as they prepare to defend their Absa Cape Epic title in similar conditions next month. Runners-up on the final stage, half a minute later, were Team Telkom’s South Africans Waylon Woolcock and HB Kruger with the Topeak-Ergon Racing pair of Kristian Hynek (CZE) and Alban Lakata (AUT) in third a further 10 seconds back. The stage victory saw Platt and Huber extend their final overall winning margin to an impressive 08:55 over runners-up Woolcock and Kruger. Rounding out the General Classification podium was the all-South African Team NAD Pro pair of Nico Bell and Gawie Combrinck. “I’m really happy with this win today. It is very good preparation for upcoming races and it shows our shape is really good. It is great for motivation,” said Huber. “Today was quite a relaxed day and we only really had to make sure we were in the front when we went into the singletrack to save some energy. We decided to go for the stage win because it’s the best way to train and get into the right rhythm. We are on a really good level,” added Huber. 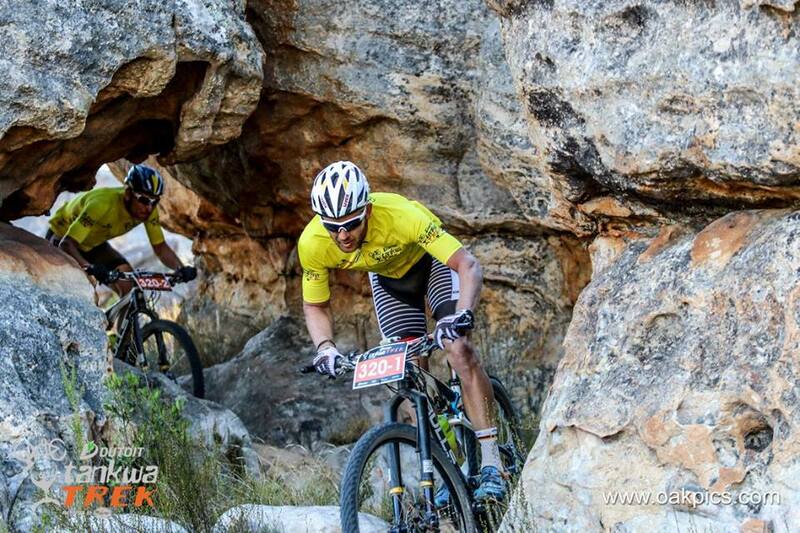 Eventual winners, Karl Platt and Urs Huber (in yellow on the right) carve their way through the rocky landscape on their way to winning the final stage of the Momentum Health Tankwa Trek, presented by Biogen on Sunday. Chasing them (on the left in blue) are Waylon Woolcock and HB Kruger, who finished second on the stage. “Today was very special. I know this stage pretty well and I know you have to be in front at the singletrack. As we hit the singletrack sections we always controlled the race, which makes it faster and more fun. The condition of the singletrack here is from another world. It was really fun to ride,” said Platt. “It was a strange situation today. There were us and three other teams at the front and nobody wanted to work. We didn’t need to work because we had the Yellow Jersey. Then a big group from behind caught us. I said okay, we’ll do the work but if we do the work then we go for the victory. We put the hammer down and enjoyed the last 20km of singletrack. It’s great to win this race again. 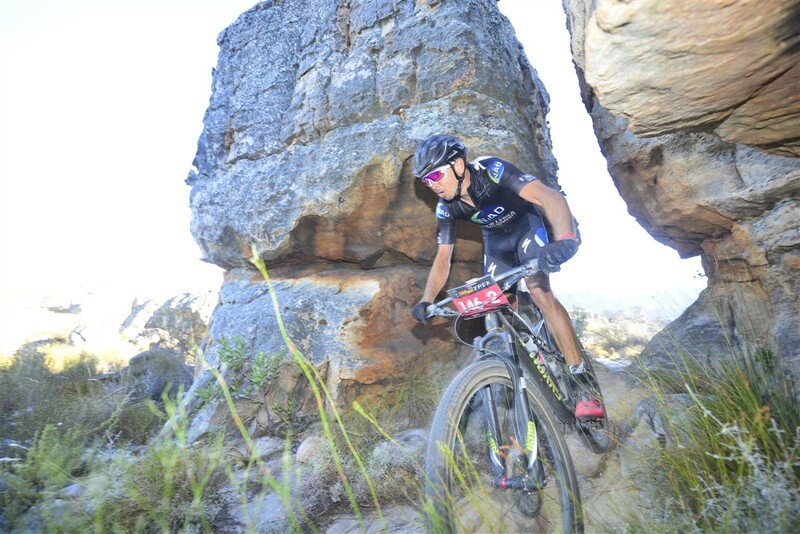 We are in a good place for the Cape Epic,” added Platt. In the Solo men’s race, Belgian Frans Claes dominated, winning all three stages and the overall title ahead of South Africans Dylan Rebello and Charl-Pierre Esterhuyse respectively. American Jeremiah Bishop sets the pace at the front of the men’s lead group during the final stage of the Momemtum Health Tankwa Trek, presented by Biogen on Sunday. 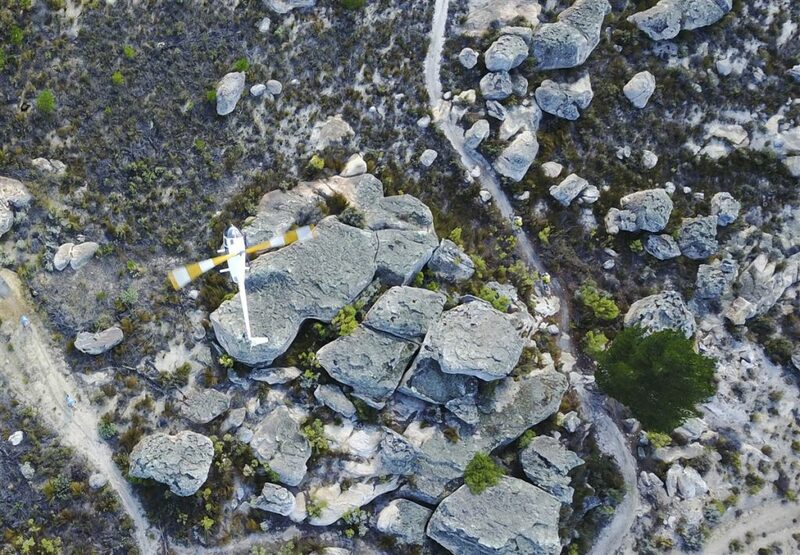 The Veteran men’s title was taken by the South African pair of Hannes Hanekom and Ben Melt Swanepoel (Tru-Cape/Garmin) ahead of Germans Thorsten Keller and Udo Böelts (Craft Rocky Mountain), with Team SlenderWonder-Midas’ Igna de Villiers (RSA) and Paul Theron (RSA) securing the final podium spot. The Masters category podium was an all-South African affair, with Greg Anderson and Deon Kruger (Bus Boys Masters) capturing the overall win ahead of Landon la Grange and Peter Winn (CLASS OF 82) and Marius Nel and Waleed Baker (PitstopSport24hrs) respectively. 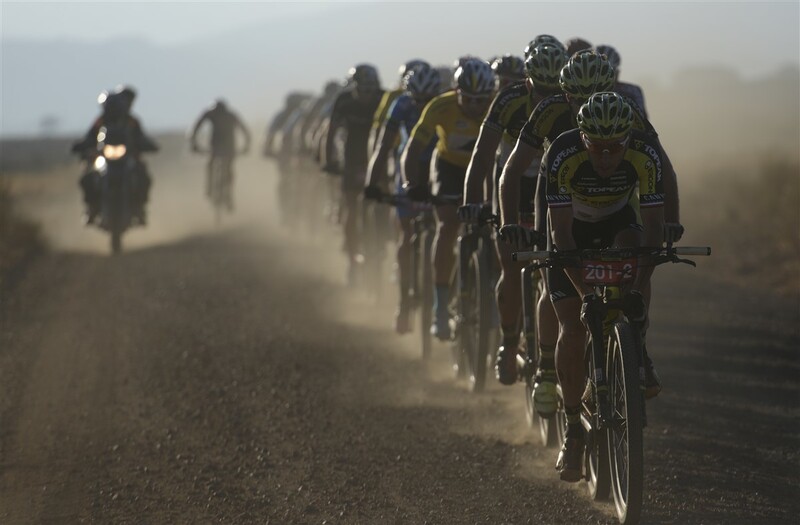 For extensive photo galleries and daily video summaries of the world’s most prestigious three-day mountain bike race, visit the Tankwa Trek Facebook page. For more information on the event or to enter the 2018 Momentum Health Tankwa Trek, presented by Biogen, visit www.tankwatrek.co.za. 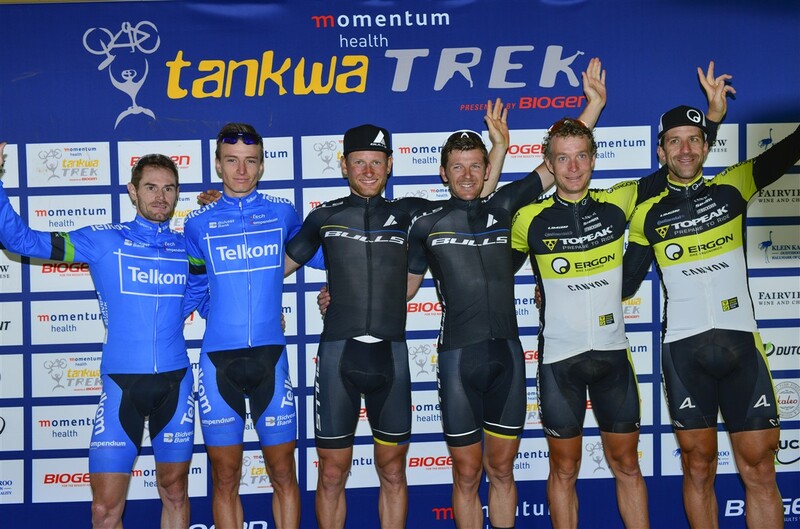 Men’s Stage 3 podium of the Momentum Health Tankwa Trek, presented by Biogen on Sunday. From left: Waylon Woolcock and HB Kruger (second), Urs Huber and Karl Platt (first) and Kristian Hynek and Alban Lakata (third). Waylon Woolcock negotiates the singletrack on his way to second place (with teammate HB Kruger) during the final stage of the Momentum Health Tankwa Trek, presented by Biogen on Sunday. 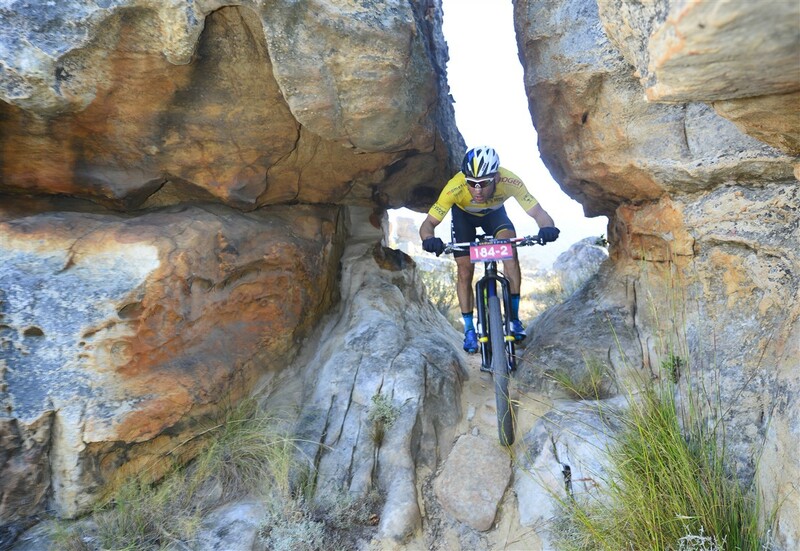 Nico Bell negotiates a rocky section on his way to third place overall (with teammate Gawie Combrinck) during the final stage of the Momentum Health Tankwa Trek, presented by Biogen on Sunday.